We are a leading Manufacturer of tylosin tartrate 50 % powder from Thane, India. We are one of the widely acclaimed manufacturers, exporters, and suppliers of Tylosin Tartrate 50 % Powder. 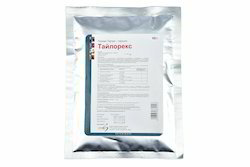 The offered tylosin tartrate powder is very effective in the treatment of infections caused by microorganisms and bacteria such as campylobacter, mycoplasma, and Pasteurella. Our exported tylosin tartrate powder is acclaimed for treating gastro infections in animals such as cattle, sheep, goats, dogs, cats, and swine. Looking for Antimycoplasm Products ?